It seems our little garden, seen in its infancy here, is just on the verge of exploding. Now in its third summer, everything seems to be growing in bigger and more glorious than ever. Or maybe it’s just the indecent amount of rain we have gotten this spring. The way things are going, my poor sage is going to get trampled by other flashier plants and flowers. Good thing we have several plants. 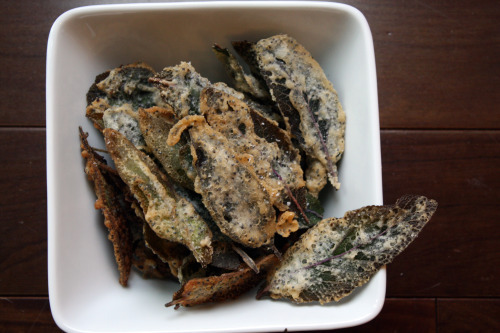 I have made these fried sage leaves several times and they are one of Randy’s all time favorite things. As stated above, they are not one of my favorites to make but I sure love to eat them. Frying is tricky for me. Because I don’t do it all that often, I find it intimidating. These are not deep-fried – I can literally count on one hand the number of times I have deep-fried – but still working with hot oil and batter makes me nervous. Inevitably, I start when the oil is not quite hot enough and then end up with a few soggy leaves that need to be tossed. This batter makes enough for plenty of leaves though and I even had to send Randy out in the rain to pick more. This doesn’t seem like the kind of thing that would keep well, but they do indeed keep overnight and retain their crunch. In a medium bowl, mix the rice flour with the poppy seeds, ½ tsp. salt and the pepper. Whisk in the club soda and cold water. Let the batter rest for 20 minutes. This is the only way I like sage….I love it crispy in butter over pasta with walnuts, and as a snack like this! I don’t do much frying either…and no deep frying. Ever. Partly because I’m pretty sure I can’t be trusted around hot oil and partly because when I’m eating something deep fried..I prefer not to know that it has oil in it. 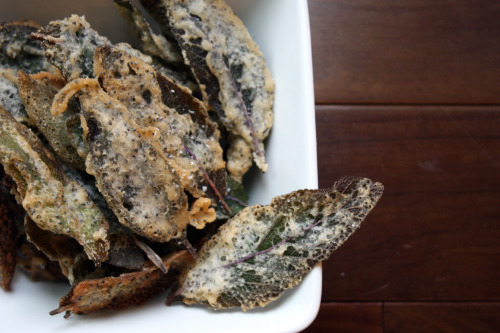 These fried sage leaves look delicious. I’ve never thought to fry an herb before but I could see how fried sage could be particularly good. Uhg, I hate to fry food too. I’m always so scared I’m going to splatter everywhere and burn myself. I’d get one of those cover things, but I know I’d barely ever use it. But I did do something similar to parsley before and it was pretty good. Well thank you for sharing this, my goodness, sounds delicious! I’m working on a little herb garden myself, I’ll keep this one bookmarked for when the sage is ready. An absolutely wonderful idea. I never would have thought of that, but why not? Sage is great in anything. Thanks for sharing this. I confess, too, that I get scared of frying. I took a class last year at PCC and the hot oil from a pan of Thai food popped and burnt my eye. Ouch! these could be seriously addicting…why haven’t i seen these before? how clever and evil all at once. I’m with you, I’m not keen on the hot oil cooking either. I havent seen these before, they are so pretty and I totally trust your recommendation. Hope you have a great time in SF! I can see why Randy loves these!